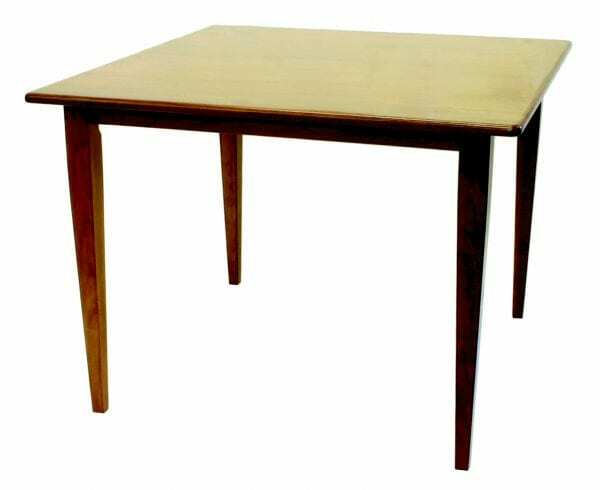 42″ x 42″ Shaker Pub Table shown in Cherry. Standard Features: #25 top, 3 1/2″ wide skirting, #100 edge, wood slides, 36″H or 42″H Pub legs, 2 3/4″ Shaker legs. Options: #5 top, 2 3/4″ Country turned legs, 2 3/4″ Plain turned legs. Available in sizes: 36″-54″W x 36″-54″L (6″ increments). Leaves: Up to 3.